There is no doubt about the high risk for injury when playing a sport like hockey. The chance of sustaining a serious injury depends on your position, your level of participation and the type of protective equipment you are wearing. Also, the behaviour of other players can increase or decrease your risk for serious injury. From shoulder and knee pain to elbow and lower back pain, to concussions, you could suffer some chronic conditions following a hockey injury. What Are the Most Common Injuries in Hockey? Concussion – A concussion can occur when a player is knocked out or violently struck in the head. If you feel confused or have a headache after losing consciousness, you should seek medical attention right away. 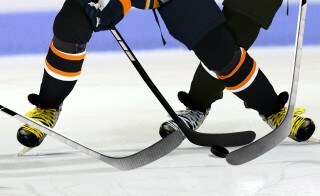 Shoulder Injuries – Hockey can cause significant shoulder injuries and shoulder pain in Calgary. Separation and a broken collarbone are the most common shoulder injuries in Calgary. Back Injuries – You are generally at low-risk for back injury, but could sustain hyperextension injuries and lower back pain while playing hockey. Elbow Injuries – Your elbows are a frequent point of contact in the sport and it is not uncommon to have recurring inflammation or pain in the elbow. Knee Injuries – Chronic knee pain in Calgary is a common complaint amongst hockey players. From ligament damage to anterior cruciate ligament disruption and tears, there are numerous risks to your knees. Wearing elbow pads that fit well and have proper openings. Wearing well-fitting skates with proper laces. Never using your hands to brace yourself or stop a fall on the ice. Wearing hockey pants with reinforced padding over vulnerable areas. Resting and treating injuries if they do occur. If you have suffered from a painful, serious hockey injury, contact Alberta Back and Neck Rehab & Sports Injuries Clinic for a full assessment. Call us at 403-234-0040 or contact us online to schedule your appointment.